May the peace and blessings of God be with you. In the name of God, the Most Beneficent, the Most Compassionate. I testify that there is no god but God and that Muhammad is His Prophet. and upon all his family and companions. and remove us safely from amongst those who would oppress us. 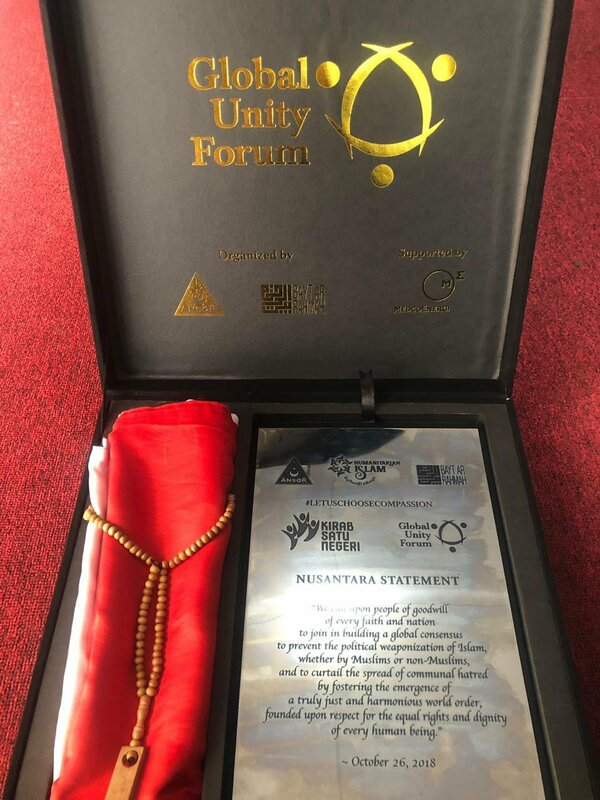 Exactly four weeks ago—on October 26, 2018—the epic journey of Gerakan Pemuda Ansor’s Kirab Satu Negeri (“One Nation Parade”) concluded in Yogyakarta. This enormous undertaking lasted a total of 41 days. 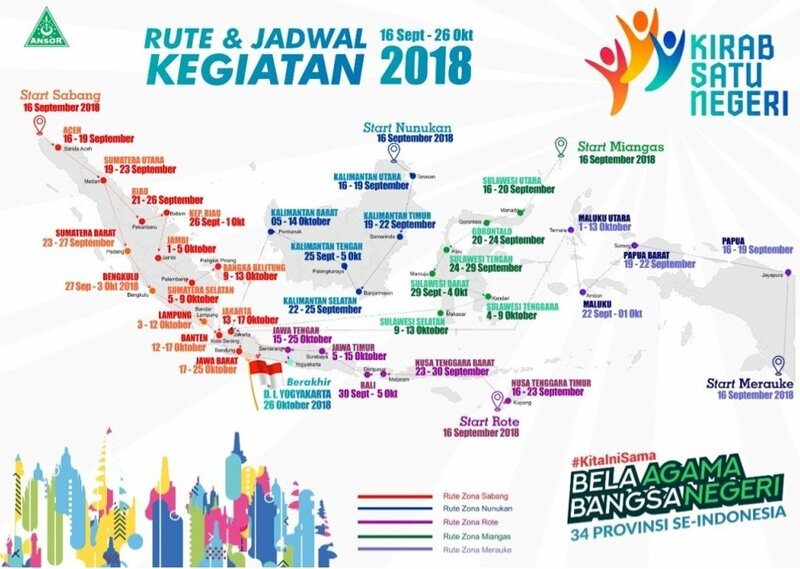 On September 16, we launched the Kirab at five strategic points at the outermost fringes of the Indonesian Archipelago: Merauke (on the island of Papua); Miangas (Sulawesi); Rote Island (East Nusa Tenggara); Nunukan (Borneo); and Sabang (Sumatra). 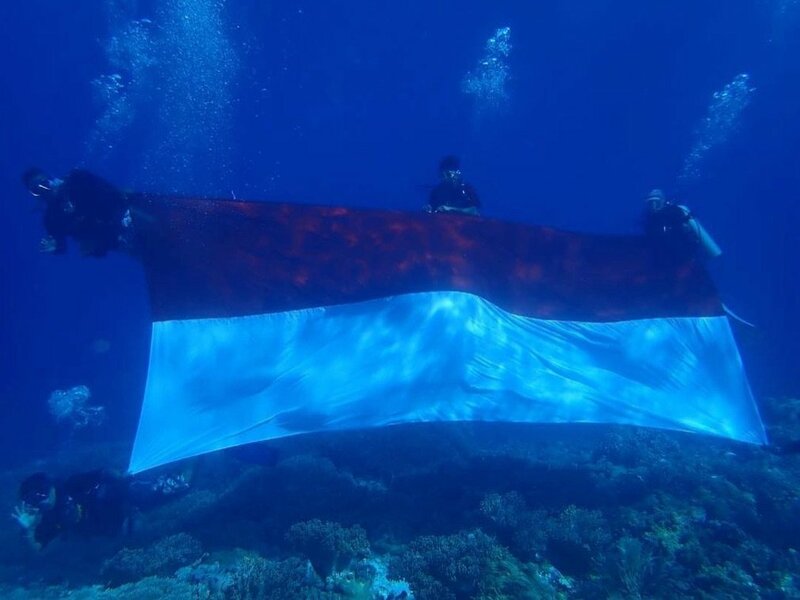 At each of these five locations, Ansor raised aloft seventeen (17) Red and White flags [to commemorate the founding of Indonesia as a Pancasila nation state on August 17, 1945]. In all, 85 Red and White banners were raised upon wooden flagstaffs and paraded across each of our nation’s 34 provinces, including 188 [out of 514] regencies and cities, where millions of our Indonesian brothers and sisters—from countless ethnic, cultural, religious and linguistic backgrounds—joined us in celebrating the rich diversity of our nation. These 85 Red and White Banners bore silent witness to an immense array of events, including public dialogues commemorating our nation’s heritage; gatherings to express fellowship among and between our fellow citizens, of every faith and ethnicity; pilgrimage to saints’ tombs; recitation of scripture; mass gatherings to pray for the well-being of our nation; convoys and flag ceremonies; artistic and cultural performances; competitions; the planting of trees and provision of social services; and raising our nation’s Red and White banner upon a lofty mountain peak; in the midst of a fertile rice field; upon boats cruising along a river; and beneath the sea in Raja Ampat. Our Kirab Satu Negeri contingent also visited Lombok and Palu, to express empathy and console our brothers and sisters, who are victims of the recent earthquakes and tsunami. Kirab Satu Negeri broke two national records: first, by installing the longest Red and White banner ever created, upon Indonesia’s border with Papua New Guinea at Jayapura; and for sewing 1,945 Red and White flags in the courtyard of Indonesia’s original First Lady, Ibu Fatmawati, in Bengkulu, Sumatra. We did all of this, Mr. President and respected members of our audience, because we want Indonesia’s national consensus to remain sturdy and unshaken. 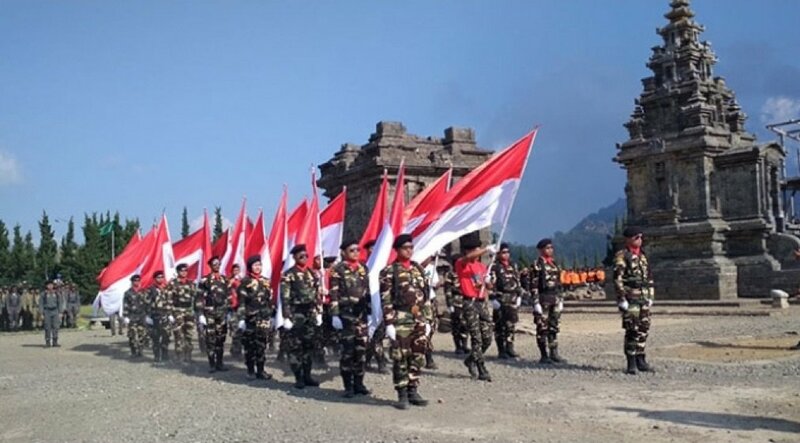 Pancasila, Bhinneka Tunggal Ika (Unity Amid Diversity), NKRI and the 1945 Constitution remain the unifying ideals, and principles, that bind the innumerable threads of our diverse nation together. We are indignant, and indeed furious, to witness the actions of a small group of people who do not respect the enlightened vision of our founding fathers, nor the enormous sacrifice of the heroic warriors who secured our nation’s independence. They [Islamist radicals, aided by foreign governments and cynical allies among Indonesia’s political, economic and military elites] seek to destroy Pancasila, NKRI and the 1945 Constitution, which serve as the basis of our national unity, and replace these with a different political structure [viz., an Islamic state or caliphate] and constitutional basis [derived from obsolete and problematic tenets of Islamic orthodoxy, which are premised upon perpetual conflict with those who do not embrace or submit to Islam]. Mr. President, beloved kyais and respected members of our audience: the events we see unfolding in the Middle East and beyond—where conflict in the name of religion, and especially Islam, has caused immense human suffering—is a matter of profound concern to us. Above and beyond our sympathy for the people of these regions, we are acutely aware that the mindset on display in the Middle East has begun to penetrate our beloved country. Conscious of the virulent threat that confronts us, Gerakan Pemuda Ansor always and explicitly rejects those [Sunni radicals] who claim to possess a monopoly on religious truth while condemning the beliefs of others, who constitute the majority of Indonesia’s citizens. Gerakan Pemuda Ansor also rejects the weaponization of religion as a political tool to acquire worldly power, which the tragic example of the Middle East and other regions proves to be a source of bitter conflict and division—by deliberately inciting the inhabitants of a nation to despise, reject and even seek to destroy their fellow citizens. We, the Indonesian people, must learn from the tragic example of other nations that are being ripped apart by fake news spread through social media; by political propaganda disseminated in mosques; by slandering governments and government figures, during dawn and Friday prayers; by raising the flags of treasonous or terrorist groups—such as ISIS, al-Qaeda and Hizb ut-Tahrir—as if these banners represented Islam and the Muslim community at large; and by issuing religious fatwas for the sole purpose of acquiring power. We, the Indonesian people, must be alert to recognize these patterns of thought and behavior, which have devastated other countries and which [Islamist radicals] seek to introduce as normative practices in our beloved nation. Mr. President and respected members of our audience: our kyais [Nahdlatul Ulama religious scholars] teach that the primary message of Islam, and its very essence, is rahmah, or universal love and compassion. God—Pure and Exalted is He!—has said: “We sent you (Muhammad) for no purpose other than to serve as a blessing for all creation (rahmatan li al-‘alamin).” This message of universal love and compassion explains why Nahdlatul Ulama kyais drafted, endorsed and declared Pancasila to be the permanent ideological foundation of the Republic of Indonesia. 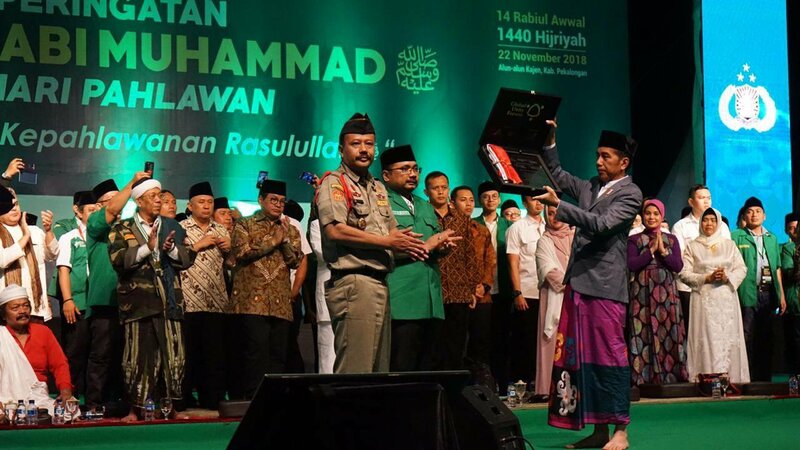 This message of rahmah also underlies, and explains, why Nahdlatul Ulama kyais agreed to establish NKRI [a multi-religious and pluralistic nation state, rooted in the 1945 Constitution, whose preamble includes Pancasila] as the communal home of all the diverse elements within this pluralistic nation, whose strength and integrity must be preserved for the common welfare of all of us who dwell together [in Nusantara, or the Indonesian Archipelago]. Mr. President, beloved kyais and respected members of our audience: Finally, I invite all of us—and most especially, the assembled cadres of Gerakan Pemuda Ansor and Banser—to live our lives in accord with the Mawlid spirit and apostolic mission of the Prophet Muhammad (saw. ), namely, the mission of rahmatan lil ‘alamin; that is: the mission of spiritually elevating humanity in order to achieve justice and equality, founded upon the state of universal love and compassion (rahmah) that emerges naturally in the hearts of those endowed with noble character. To the President of the Republic of Indonesia: On behalf of every member and cadre of Gerakan Pemuda Ansor, I ask that you accept this Red and White banner—one of 85 such flags raised aloft and paraded throughout our nation during Kirab Satu Negeri—and this copy of the Nusantara Statement, in the hope that God—Pure and Exalted is He!—will endow you with the power to unify our nation and lead Indonesia to fulfill its destiny as an inspiration for world peace.